After improve the sound and image, with the OPL4 Shockwave and V9990 Powergraph cartridges, now is time to improve the math capabilities of our lovely MSX machine. Yes we know! Without software, the hardware isn't usefull. This is the reason because the new cartridge isn't for sale yet. 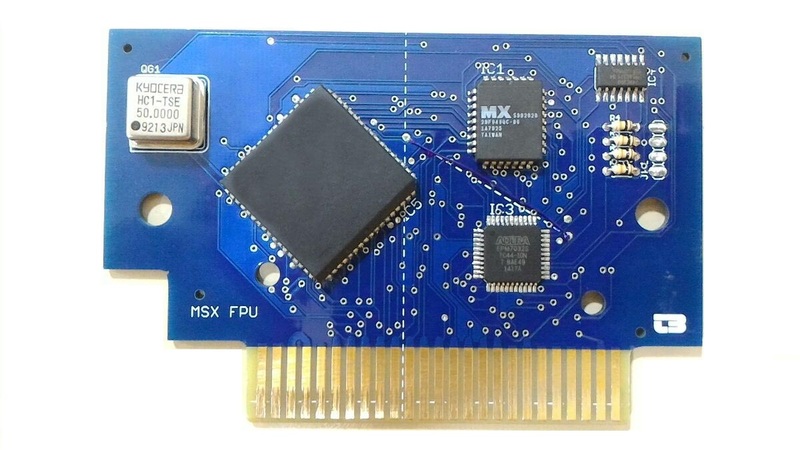 We are working together with the Oldbits Studio team to develop the library that will be used with the MSX-FPU cartridge. Do you already imagined the "Angry Bird" physics, real time calculated, in your MSX? So... you can start to imagine it now! O FPU seria uma evolução do VSU? A FPU é uma unidade de ponto flutuante, também conhecido como co-processador matemático. O objetivo é melhorar a performance em cálculos do MSX, ponto crítico do Z80. Wow. wanna see a demo! how could we get some spec info about how it works, functionalities , etc? Na verdade não. A sigla FPU vem de Float Point Unit (ou Unidade de Ponto Flutuante) e auxilia nos cálculos matemáticos. Também chamado de co-processador matemático, ele aumenta consideravelmente o poder de realizar cálculos do MSX. You will can use in the MSX-Basic. I mean not as an extension with new commands, but a speed up for basic . So also existing programs benefit . Yes, we will try to change the MSX-BASIC to use, when necessary, the new library. Then, the old BASIC programs will take the benefit of MSX-FPU's speed.